Sleaford has come under the spotlight in the worldwide debate about the population’s use and disposal of plastic waste which is finding itself into our rivers and oceans, harming wildlife and eventually getting into the food chain. The BBC has been running a hard-hitting documentary on the issue, and last week Sleaford’s own litter problem came under scrutiny as the town’s Rivercare Clean Up team swung into action on Sunday. The area being targeted by the team as part of its regular fortnightly clean up programme, was the section of river near Southgate alongside the Riverside Precinct. Lincolnshire RiverCare and BeachCare Project Officer Cate Holborn explained: “The section of waterway is just upstream of a road bridge which was built on top of an old footbridge. “Due to the narrow and low structure of the old bridge, a natural dam is often formed of fallen branches and other debris, thus it is a prime place for litter and plastics to accumulate that have found their way into the river. “Because of the hard work and dedication of the Sleaford RiverCare volunteer team we are tackling the litter in the waterway, but it is a gradual process. Anyone can join in with the team of volunteers who are supported by Anglian Water and Sleaford Town Council. The town council also sweeps the streets and empties bins daily, but Mayor of Sleaford, Coun Grenville Jackson, last month staged an environmental awareness event for local groups to recruit more volunteers, increase co-operation and hopefully educate the public in avoiding dropping litter in the first place. He said it is made worse at that section of the river as the wind can blow any litter off the precinct into the water to get tangled with river weed when the water is not flowing much. He added that further downstream the river is clear and clean thanks to the work of the clean up teams and work on the banks. 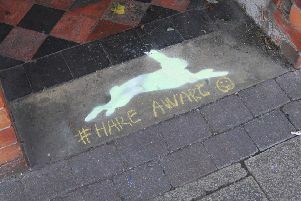 Out with the mud hares, in with the chalk silhouettes! He said if the county council, which owns the land, could clear it up then volunteers would be willing to keep on top of it, but currently it was not safe. 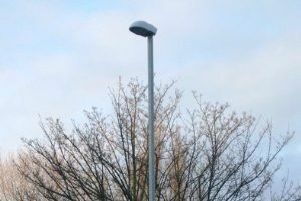 He added that for a small outlay, the county council could also tidy up the litter at areas around Holdingham roundabout as a result of the local fast food outlets.